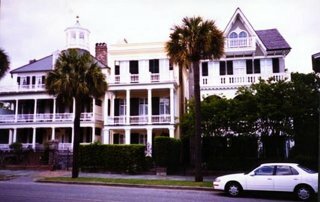 We arrived in Charleston early in the afternoon, checked into our hotel, and decided to take a look around the historic district. 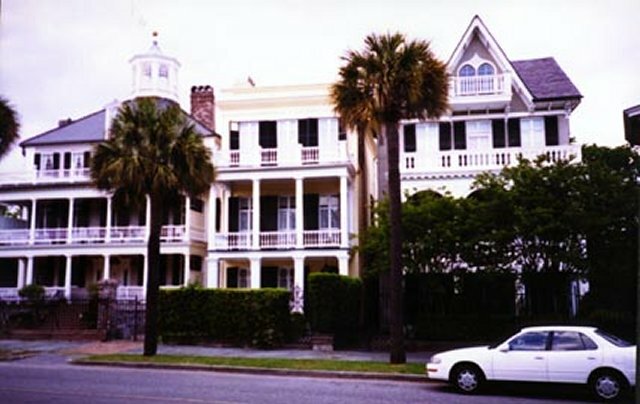 There are guided walking tours and carriage rides but we chose to stroll through old Charleston at our own pace and wander up and down the narrow streets. 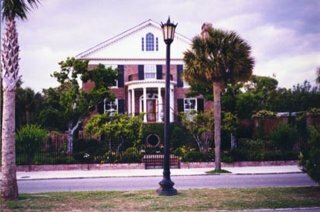 If you're looking for houses with character, Charleston is for you. Many of the old homes have walled gardens with wrought iron gates and cats watching from the windows above. A well-known address in Charleston is 2 Meeting Street. It is now a bed and breakfast inn. 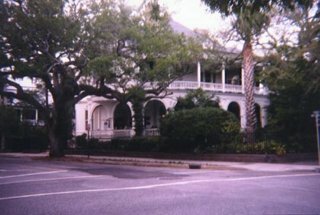 Old home on Murray Blvd. in Charleston facing the Ashley River. While walking along the waterfront, we saw dolphins frolicking in the river. All that walking worked up an appetite so we checked out the dining in the historic district and chose Sticky Fingers where we ordered the rib sampler for two. We tried the Memphis Style Dry, Memphis Style Wet, Carolina Sweet, and Tennessee Whiskey. It's difficult to pick a favorite, but the house specialty, Carolina Sweet, is worth a return trip to Charleston.